Yesterday was a busy Fourth of July. Natalie and Fabien got up and rode in the morning, I slept in, though I had planned on getting work done on the 240z. Around noon we left the house and headed west. We looked at a few properties for sale, two in Wildwood and one down south of Pacific. The good one in Wildwood is amazing, and might just work out for us, so we're going to try to go get a tour of it very soon. It has almost 5 acres, a barn with two horse stalls, a hay shed and various other features. The property we looked at south of Pacific would be very cool, but at only 2.3 acres doesn't look to be a very good horse property. I loved it because it had a total of 7 garage spots! After that we picked up Lindsey and headed downtown to the VP Fair and then to the baseball game. The closer we got downtown the darker it got, and eventually started raining. We ended up camping out in the Tahoe for about 15 minutes while we waited for the rain to pass. From there we walked up to the stadium and then over to the Arch to see the fair. Honestly, the fair sucked. There wasn't hardly anyone there and the only activities we saw were food/beer booths and some band playing on stage. Nothing else going on to make it worth our trek over there. We headed back to Busch Stadium to hang out there until the game. The game was great, the first Cards game I've been to this year that they actually won! 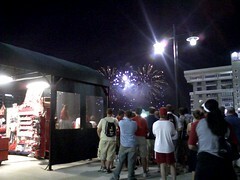 After the game we stayed up on the upper deck to watch the fireworks at the fair. I took quite a few photos with my phone, I'll post more later but here's one for now.